Beginning with the first maintenance of SAS 9.4, you have the ability to define your own symbol markers using the SYMBOLCHAR and SYMBOLIMAGE statements. With these statements you can select a Unicode value or you can select an image file that exists on the local file system—making the possibilities for customizing your graphs almost unlimited. 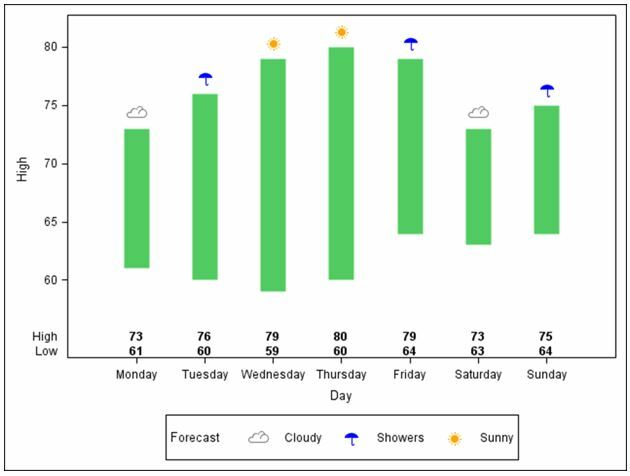 In the examples below, I’ll use a weather chart to show you two different methods for creating custom symbols to suit almost any graph or reporting need. Both techniques begin with standard Unicode values and the new SYMBOLCHAR statement. The first program below includes three SYMBOLCHAR statements. Each SYMBOLCHAR statement contains the name of the symbol and a corresponding Unicode value. Supported image types are GIF, JPEG and PNG files. Once the symbols are defined, I set up a discrete attribute map to assign the color for each symbol based on the values in the data set: Sunny, Cloudy and Showers. Everything is tied together through the DISCRETEATTRVAR statement by associating an attribute variable, SIGN, with the data set variable, FORECAST. Assigning the GROUP option a value of SIGN is the final step. The AXISTABLE statement, which is a new statement in SAS 9.4, produces the table containing the high and low temperatures inside the axes at the bottom the graph. This graph can also be produced with PROC SGPLOT using the SYMBOLCHAR statements. In this instance the attribute map is defined within the data step that creates the data set MYATTRMAP. The attribute map is referenced with the ATTRID option on the SCATTER statement. Below is sample code that illustrates the syntax. What special symbols can you use in your graphs? Let me know how the new SYMBOLCHAR statement will work for you! I have a question about the symbols in sgplot that I hope you might be able to help me with. When SAS generates my graphs I see that the lines goes through the symbol=circle, but I was wondering if SAS 9.4 is able to place the markers/symbols in front. So that the lines are not visable within the open circle?